Modern dance or strip Haggadah? 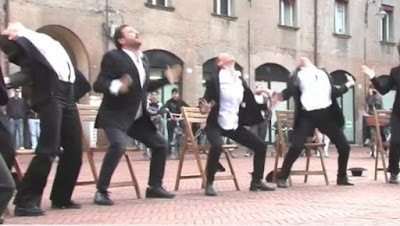 Three years ago we posted a modern dance version of Echad Mi Yodea, one of the songs at the end of the Pesach seder. Choreographed by Ohad Naharin, artistic director of Israel's Batsheva Dance Company, it includes all 13 verses of the song. This week we found a video of the same modern dance as performed in 2014 on World Dance Day in the municipal square in Ferrara, Italy. It starts about 2 minutes into the video, preceded by a short version of Ani Maamin. We don't know quite what to say about the performance, except that we wonder what would have occurred if there happened to be a 14th verse.